If you eat a lot of vegetables this has a lot of benefits including help preventing certain types of cancers, heart disease and Type 2 diabetes. Vegetables are full of vitamins and nutrients that give you added energy and will make you look and feel healthier and younger. However not everyone actually likes vegetables and it can become a bit of a chore to eat them. Some people feel that vegetables are an essential part of the meal but feel they are an unfortunate thing that has to be eaten! If you cook and prepare vegetables in the right way they can actually be really satisfying and tasty. There are a number of different ways that you can cook vegetables, anything from boiling to roasting but not all of these ways bring out the best flavors in them. This article will give you a good idea of the best techniques when it comes to cooking healthy and tasty vegetables. You know when vegetables have been cooked correctly as they turn out very bright and vibrant in color. If they end up dark and dull this gives you a good indication that they have been over cooked. Boiling your vegetables is probably the one that most people do as it is very convenient, all you have to do is boil a pan filled with water. You can even add spices and salt to the vegetables to give them even more flavor. If you are a strict health buff you probably won’t use this method very often as when you boil the vegetables, this strips some of the essential nutrients from them as well as taking away a lot of the flavor. If you steam your vegetables, they retain their nutrients and vitamins as well as keeping their natural flavors. Again you can add some salt or garlic or other spices to your veggies to add extra flavor. Steaming is just as convenient as boiling and you don’t need to be an expert. All that is required is a good and reliable steamer or a pot with a steaming basket. Vegetables such as peppers, eggplants, broccoli and asparagus are all healthier and tastier when they are baked as they keep a lot more of their antioxidants, flavor and nutrients when they are cooked this way. Asparagus and Brussel sprouts taste delicious if you roast them also. 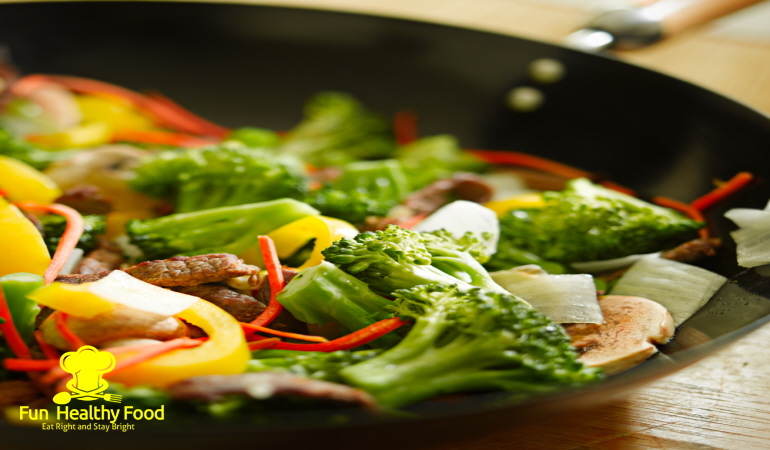 If you are looking for one of the healthiest ways to prepare vegetables this will be sautéing or stir-frying. This means they are cooked at a really high temperature whilst constantly being stirred. Because they are being cooked on a really high heat they cook quicker meaning that there is not as many nutrients and vitamins being lost. Flavors will stay within the vegetables when you cook them this way and if you add extra seasoning and spices this also blends in really well. The only downfall with sautéing is that you have to keep an eye on them as they burn really quickly which means the nutrients will be lost as well as all of the flavors. Microwaving your vegetables is an extremely quick way to cook them. It is a great method as it means minimal loss of nutrients and antioxidants from them and does not sacrifice the flavors either.